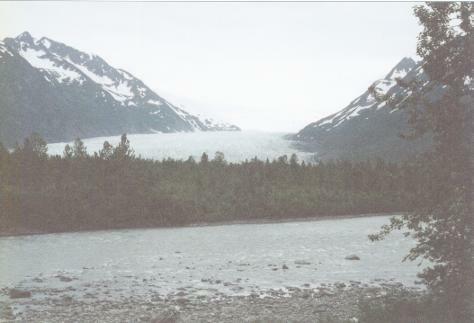 Welcome to a page highlighting a few scenes from our Alaska Adventure. "The 49th State" was also the 49th state that I have set foot in, and Rosemary and I came to visit for our 10th wedding anniversary. Of course we took the kids, and they're here, but the main focus of this page is our observations of some of the scenic beauty of the very tiny fraction of the state that we toured. These photos were taken in mid-August 2001. By the way, in case anyone thinks we are independently wealthy, most of the trip was courtesy of a mountain of frequent flyer miles. We start at "Mile 0"! 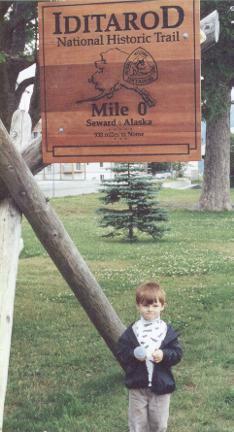 Only 938 miles to Nome on the Iditarod Trail, which begins in Seward where this picture was taken. 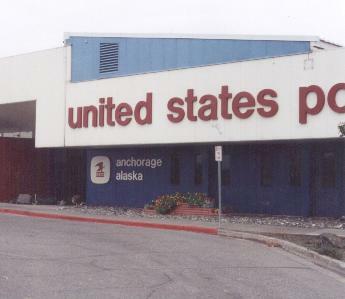 The famous Iditarod Race begins in downtown Anchorage and commemmorates the real race of 1925 which was against time to save lives from a deadly outbreak of diptheria in Nome. 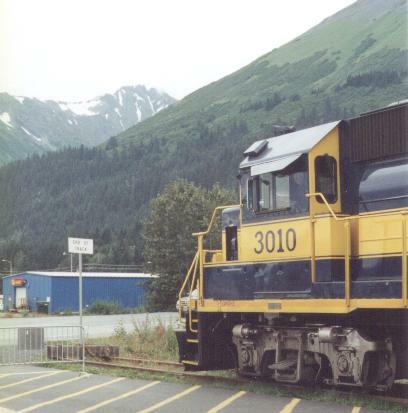 A portrait of the front of the Alaska Railroad's GP40-P diesel locomotive number 3010. 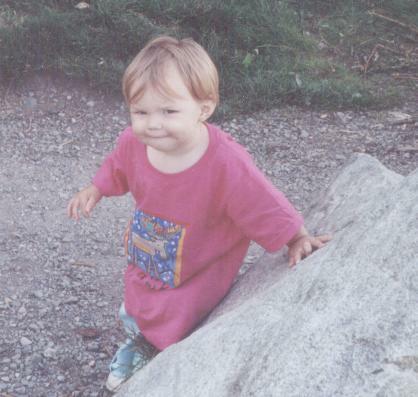 If you've been to the Photo Page from December 2001, you've seen the shot with Kieran which was taken at the same location. The sign reads "End of Track" and they are not kidding! 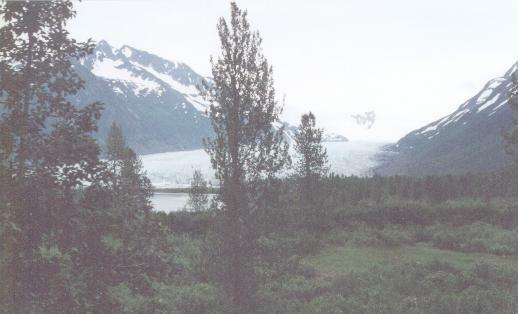 This wasn't where the Alaska Railroad originally ended, here about a mile or so north of the center of Seward. The incredible 1964 earthquake which devastated Seward caused over a thousand feet of waterfront, and much of the Alaska's terminal facilities, to slide into Resurrection Bay. The tsunamis which followed the quake finished off the railroad yard. It was never rebuilt and the line pulled back to this point. 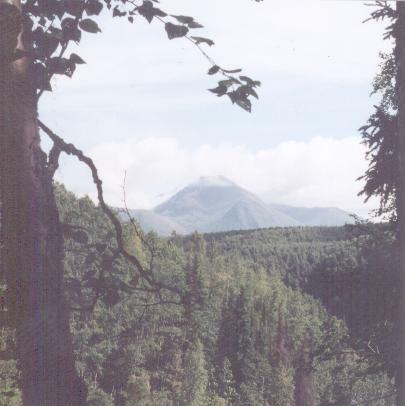 But don't you just love the lush green of the pine trees in the background? 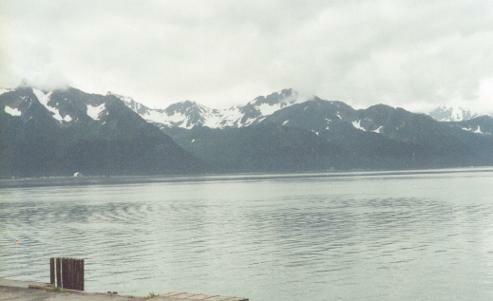 And keep in mind that it was a cloudy day in Seward! And here is Resurrection Bay. It may have been August, but this picture still feels cold to me! In case you are wondering about the location from which we mailed the postcards... OK, it's not really scenery, but the kids had fun with putting on the stamps and such... plus my dad worked for the Postal Service for a number of years. 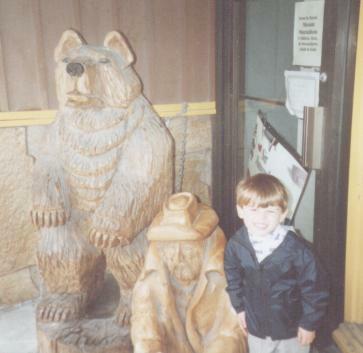 Kieran does his best grizzly bear impression, outside a store in downtown Anchorage. On the last day of our far-too-short visit came a precious moment that Rosemary and I will always remember. We were at the Iditarod Trail Center in Wasilla (an easy one hour drive north out of Anchorage) and here Thalia is being introduced to a seven-week-old pup. All she could say, with glee, was "GIE"! As in, "Doggie!" but she couldn't quite get the word out. It was one of her first words ever, and you can't fake that joy. 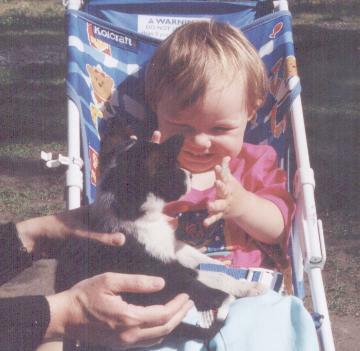 And she's had a soft spot for "doggies" ever since. 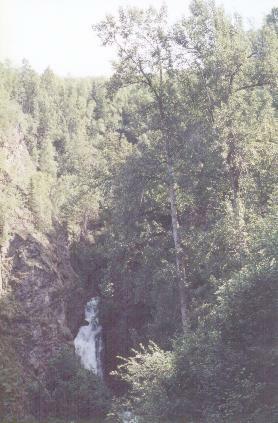 On the way back from Wasilla, we stopped at a small state park which was said to contain an "easy" trail to a picturesque waterfall. Well, "easy" is of course relative, especially to a knowledge worker who probably doesn't exercise enough and is encouraging two kids to come along. Thalia, in her new "Alaska" t-shirt, was certainly willing to give it a go! I'll let you judge "picturesque" for yourself. We know how we feel!